From left: Elizabeth Polzin, Christopher Brandt, and Andy Miller are just a few of the people making sure students are fully supported and encouraged to do their best at Concordia. Concordia’s award-winning academic advising team has got students’ backs. Last fall, Concordia achieved an impressive 82 percent student retention rate. It was a 10-percent jump from the campus’ 2016 retention, not to mention an all-time record for the university. While there were a number of factors at play and multiple individuals to credit for the retention boost, Concordia’s academic advising model noticeably underwent a massive overhaul within the year preceding the shift when Assistant Vice President for Student Success Elizabeth Polzin came on board. Using analytics as their guiding force, a cross-departmental group made up of Polzin, Director of Academic Advising and Career Engagement Andy Miller, and Director of Business Intelligence Christopher Brandt reinvented or reinvigorated a significant number of the academic support services that play a key role in the retention equation. 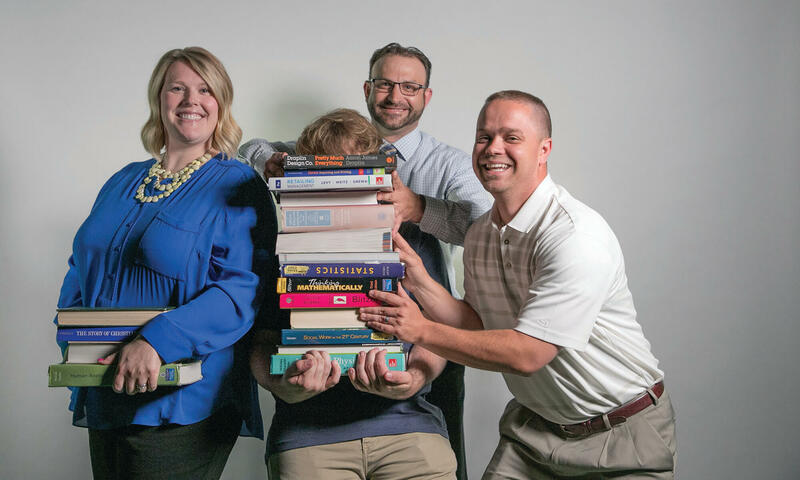 For their efforts, the trio was awarded a 2018 Blackboard Catalyst Award in the category of “optimizing the student experience,” the highest honor given out by the academic technology company that serves 16,000 education-focused clients worldwide. Changes within the advising model include PROSPER, for those in need of academic coaching upon entry into the university; STAR, for students on academic probation; and FAST, an academic early alert task force that meets weekly throughout the academic year. The programs, which are led by Miller, were each started or revamped within the past two academic years and have shown impressive results ever since. In 2017–18 alone, students in PROSPER and STAR completed more classes, earned higher GPAs, and were far less likely to be on academic probation or academically dismissed than eligible students who didn’t engage in the programs. The new approach depends on analytics to identify students in need, and the group leans heavily on Brandt, with help from Registrar Carl Butz, to manage the data models that allow them to easily access the data. Prior to the shift, academic advisers relied primarily on an antiquated midterm grade reporting practice to indicate if students were struggling in class—reports that often came too late into the semester to be able to turn the tide. But now, with the help of Brandt’s analytics, advisors have the information they need at their fingertips, allowing them to intervene early—before the semester even starts—and personally for the best student outcomes. They can tell, for example, if a student has had a significant drop in GPA from the prior term or if they’re registered for an overload of credits in a semester. “We’ve been able to use numbers to ensure that students aren’t treated as one,” Miller says. Dozens of students have benefited from the revamped model—students like Eric, who learned through the STAR program that he struggled with time-management skills. Eric was taught tips on how to make the most of his time, and a STAR coach held him accountable to utilizing them while he was in the program. Learn more about Concordia’s award-winning academic advising here.